Trieste, 7.5.2018 – On Friday, 11 May 2018, the I.P.R. F.T.T. 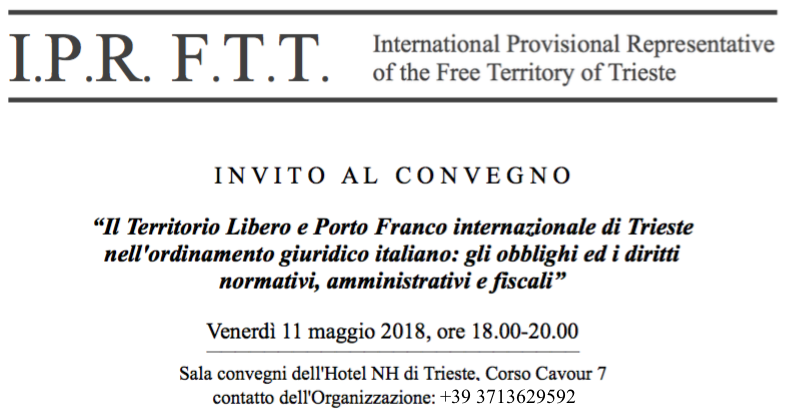 – International Provisional Representative of the Free Territory of Trieste holds a first legal-economic conference in the meeting room of hotel NH (Trieste), the title is “Il Territorio Libero e Porto Franco internazionale di Trieste nell’ordinamento giuridico italiano: gli obblighi ed i diritti normativi, amministrativi e fiscali” (The Free Territory and international Free Port in the Italian legal order: the obligations and legal, administrative, and fiscal rights). In particular, the conference is dedicated to enterprises. Indeed, this is not a political subject, but a legal-economic one, because it revolves on consolidated rights and obligations that the Italian provisional administration is bound to enforce, but has not authority to amend. The approach of the I.P.R. F.T.T. is very innovative, and its results are strategic to develop international trade and the economy of the European States between the Adriatic and the Baltic, as part of the Three Seas Initiative. For decades, the question of the Free Territory of Trieste and of its international Free Port was influenced and paralysed on all levels by the belief that it would put international law in conflict with the Italian domestic legal order. This thesis gave raise to political clashes that harmed Trieste’s economy and international trades, however, it was never verified before. The I.P.R. F.T.T. Law Commission has therefore taken care, with four years of studies, to review all international obligations of the Italian Republic and of the Italian Government respect to the present-day Free Territory of Trieste, and also the consequent legal obligations respect to all other States and the United Nations. The verification, consolidated in a rich expertise in English (LINK) and in Italian (LINK), reveals that the conflict between legislations has never existed, because the legal order of the Italian Republic and that of the EU recognize and implement, since 1947, all international obligations regarding Trieste and its Free Port. This new legal certainty does now make it possible identifying and avoiding the logical-legal paradox that certain political and administrative bodies considered to be correctly enforcing Italian and European law in Trieste with acts that, instead, were against it. This is why, starting on 5 April 2018, the I.P.R. F.T.T. has notified the expertise to the Italian Government and to all bodies in charge of the Italian provisional administration of Trieste, for all purposes of legal knowledge and inviting them to comply with the law (LINK). As for fiscal rights, the I.P.R. F.T.T. has already opened before the Court of Trieste a legal action for their determination, and more than 500 citizens and enterprises have joined it (LINK). The second hearing is taking place on May 15th. The problem is increasingly relevant due to the crisis of all enterprises subject, even in Trieste, to the excessive burden of Italian and EU taxation system, as well as by the necessity to adjust the provisions on the administration of the international Free Port to fully activate it (LINK).